Ever since I can remember, I've always had a hard time finding clothing that fits me correctly. And the idea of purchasing clothing online without knowing how a particular brand fits or trying it on beforehand absolutely terrifies me. I wish I was one of those girls that could wear anything from anywhere and have it fit perfectly, but I've accepted the fact that I can't. And this is reiterated to me almost every single time I ever try on clothing at Target. As I've come to know my own style, I've figured out where I should and shouldn't buy clothing and what brands suit my body type the best. I've also figured out that I can find shirts that fit me 10x easier than I can find pants that fit correctly. As a result, I started to invest in professional tailoring at a young age and now more than ever, I'm totally obsessed with it. In my opinion, a good tailor is worth their weight in gold. For me, a good tailor is someone who is relatively affordable, has a decent turnaround time on services and someone who can make recommendations when I'm unsure as to why something doesn't fit as well as it could. Because let's be honest, I'm always trying to keep myself in check when it comes to being too perfectionistic about the way I look or the way my clothing fits. Last fall I finally caved and jumped on the colored pants bandwagon. 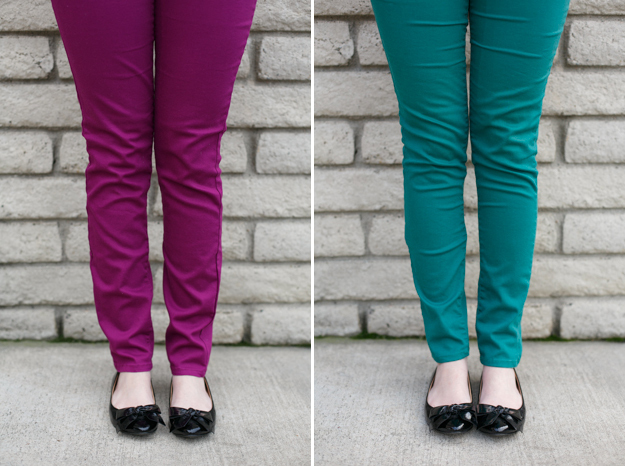 Not knowing exactly how long this trend would stick around, I didn't want to invest the kind of money I typically invest when it comes to pants, so I found a few reasonably priced pairs that didn't fit me perfectly, but were decent enough for me to tolerate because I loved the colors. A few months later, I realized that these pants I was originally so excited about weren't getting any use because every time I'd put them on, I'd hate the way they fit. Initially I told myself I wouldn't send a cheap pair of pants to the tailor because it wasn't worth it, but recently I caved and took one pair in to see if it made a difference. I'm happy to say that by simply adjusting the way the legs fit has made all the difference. Now I don't feel so frumpy every time I put them on and even though they wrinkle up a lot more than I prefer, I actually want to wear them more often. Here are some before and after photos. The pair on the left, which is the same style and brand as the one on the right, has not been altered. The pair on the right was tailored to fit more like a skinny jean and to fit my legs better. I'm a firm believer in buying cute clothes and following the trends that best suit you and your body type. But sometimes we get so caught up in a pattern, style or a good deal that we forget to recognize whether or not a particular article of clothing is actually flattering. No matter how cute something is, if it doesn't fit correctly, it's not going to look good. Sure, I make exceptions from time to time, but for the most part, I'm a stickler when it comes to fit. Because when you feel good about what you're wearing, it makes all the difference.